organisations from Saltash to Penzance and as far north as Camelford. CFA have no employed staff and for every £1 they receive, they are able to supply around £7 worth of food to the needy across Cornwall. 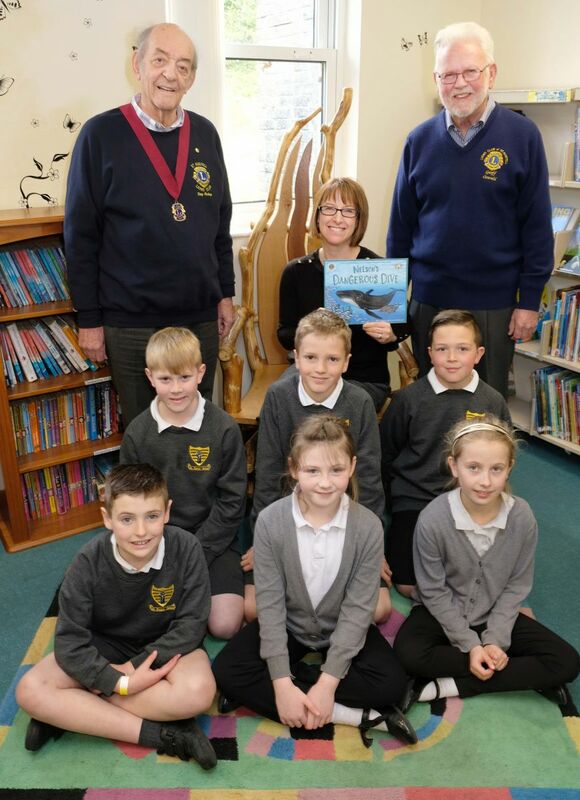 St. Austell Lions have recently supplied all 19 Primary schools in the St. Austell area with the latest book by the children's author Ellie Jackson, highlighting the dangers of plastic in our environment. The book "Nelson's Dangerous Dive" concentrates on the effect of plastic pollution in our oceans and on its inhabitants. Over 4,000 local children will have access to the book. Pictured from one of these schools are some pupils from St. Mewan together with, left to right at back, Lions Club of St. Austell Vice President Tony Pickup, Headteacher Mrs. Elaine Badger and Environmental Officer Lion Geoff Oswald. Tickets are only £2 each and your support for this worthy cause will be greatly appreciated. Look out for the draw sheet. 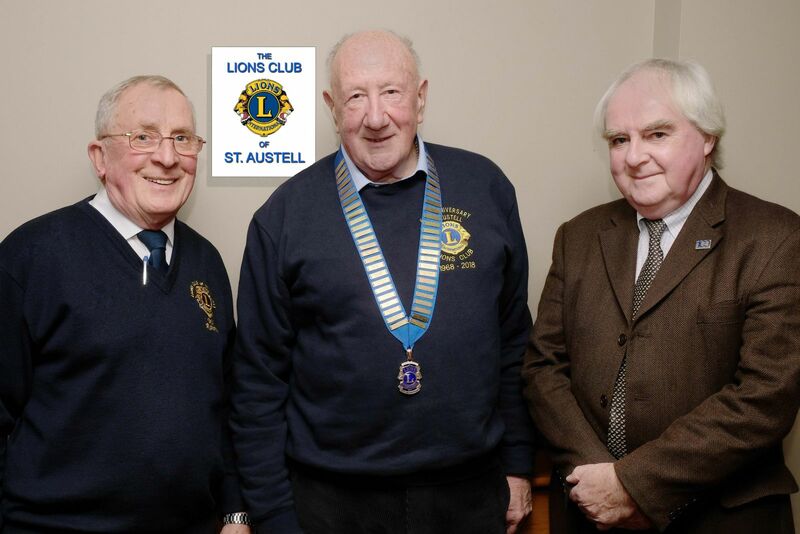 Lions Club of St. Austell President, Michael Collins, welcomed new members, James and Gail Mathers, at the Club's last meeting. James and Gail, who are both retired solicitors originally from the West Midlands, have made St. Austell their home over the last five years. 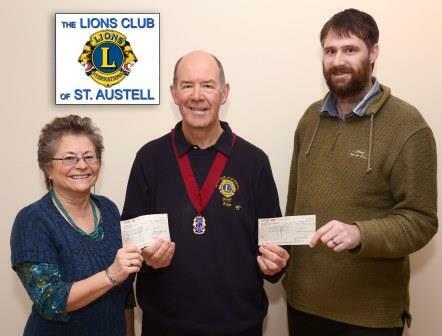 They are now keen to help and support their local community through St. Austell Lions Club. for introducing new members to the club during the Lions 100 Centenary Awards Project Year. 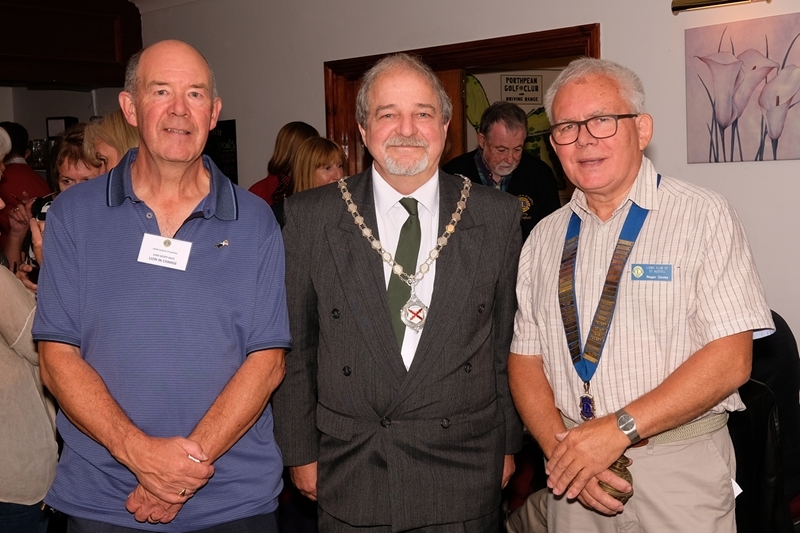 At their last meeting, the Lions welcomed Lion Lynn Goold, from the Lions Club of Fowey, who gave a most enjoyable and informative talk on 'The Way of St. James'. The Way of St James or Camino de Santiago de Compostela comprises a series of routes from all over Europe which all finish at the Cathedral in the Spanish town of Santiago de Compostela. Lynn’s talk discussed the origins of these routes, the legends surrounding it and their significance. She talked about the commitment of being a pilgrim, the preparations for the walk which were practical and physical as well as mental and what it was like to be a pilgrim. We were informed about the different routes from all over Europe and the Middle East and learnt about the importance of this movement of people through the ages. Today the route has important cultural implications and in 1987 became the 1st European Cultural route and a UNESCO World Heritage Site in 1993. 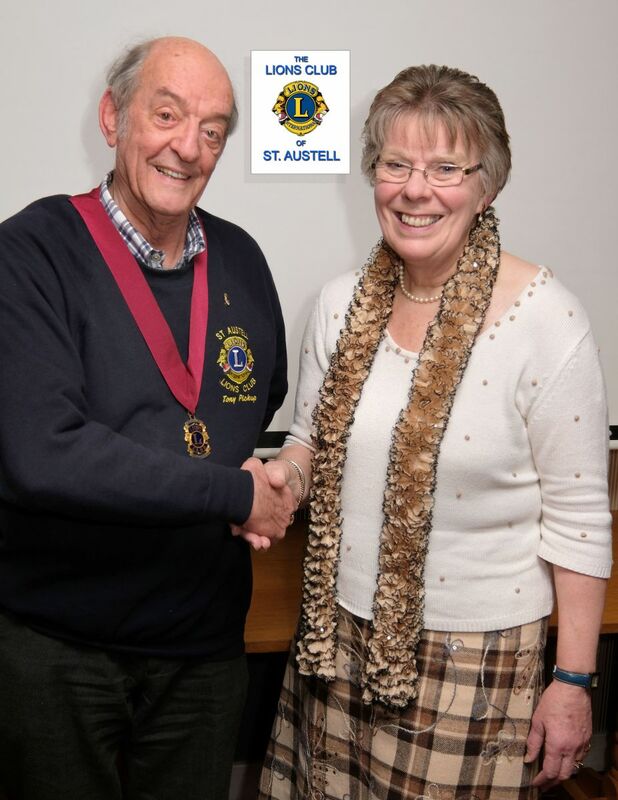 Lions Club of St. Austell Vice President Tony Pickup, speaker Lion Lynn Goold from the Lions Club of Fowey. The Lions Club of St. Austell would like to thank all the local residents who generously contributed to our Christmas Sleigh and store collections this year. As well as bringing a little magic to approximately 2,000 children, the total raised was over £4400 which will be donated to local charities. 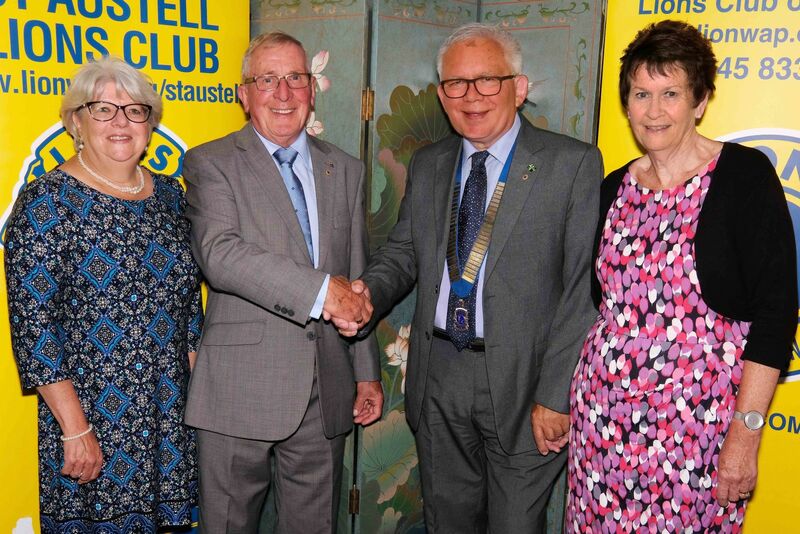 The members of the Lions Club of St. Austell welcomed a visit by District Governor Lion Peter Rowe and his wife, Past District Governor Lion Christine Rowe. After an interesting talk, D.G. 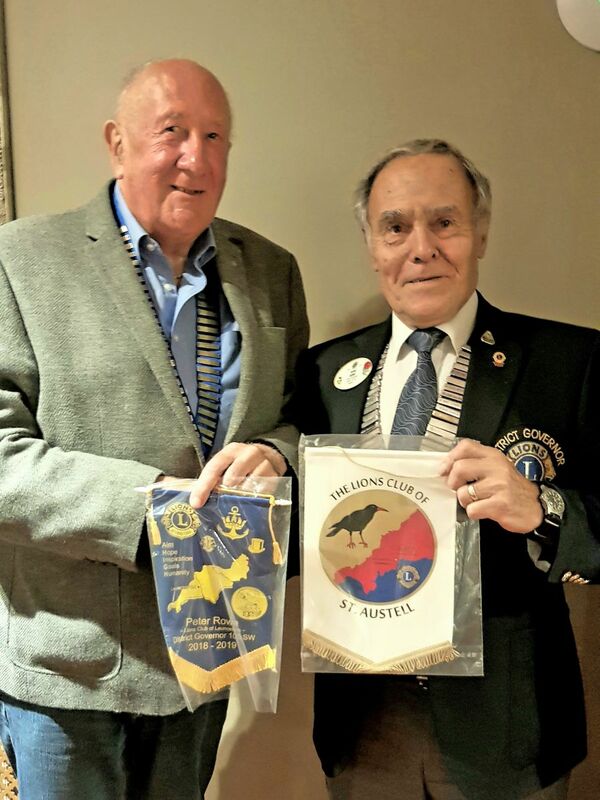 Lion Peter presented Milestone Chevron Awards to several members, including a 50 year service Chevron to St. Austell Lions President Michael Collins, an original founder member of the club. The Club welcomes new members and anyone interested in becoming a member should contact us through our website at: www.staustelllions.co.uk , or our Facebook page, or phoning us on our contact number 0845 833 9814 (calls only charged at local rates). Lions Club of St. Austell welcomes new lady member. The Lions Club of St. Austell has enrolled new member Barbara Trenerry. Lion President Michael Collins said: "It is a pleasure to welcome Barbara to our club as our first lady member, and we look forward to many more". 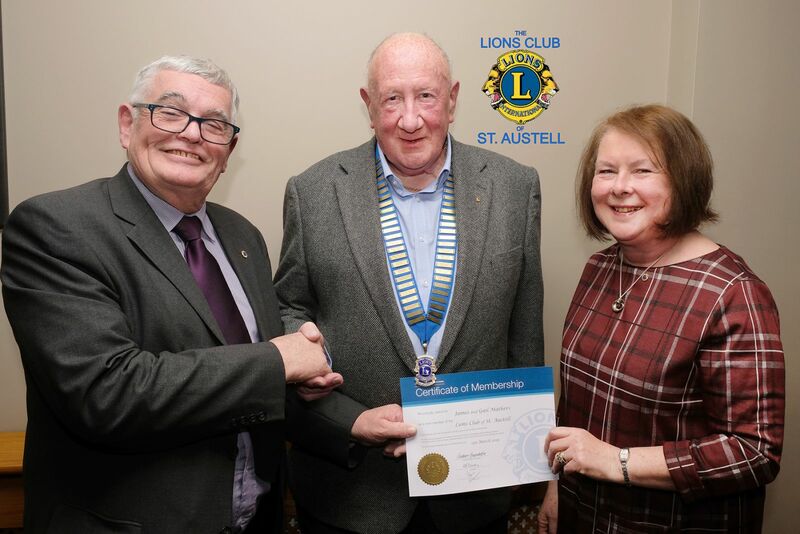 Barbara said: "As this is the Centennial year of Lions Clubs International, the fiftieth year of the St Austell Club and one hundred years since women received the right to vote, I thought it would be fitting to become the First Lady to join the St Austell Lions Club. 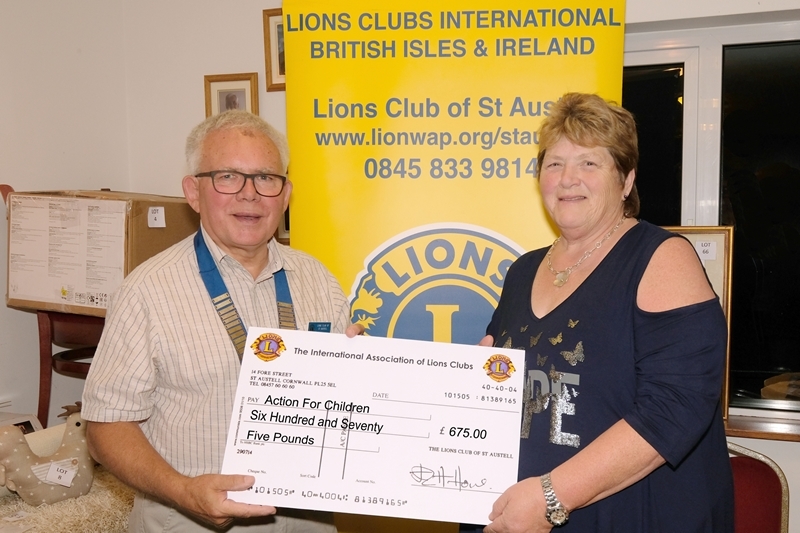 My late husband Roger was a member and the St Austell lions have been very supportive and included me in their social activities since his death nineteen years ago. Now I have an opportunity to repay their kindness and serve the worldwide community with them." The Club welcomes new members and anyone interested in becoming a member should contact us through our website at: www.staustelllions.co.uk , or our Facebook page. 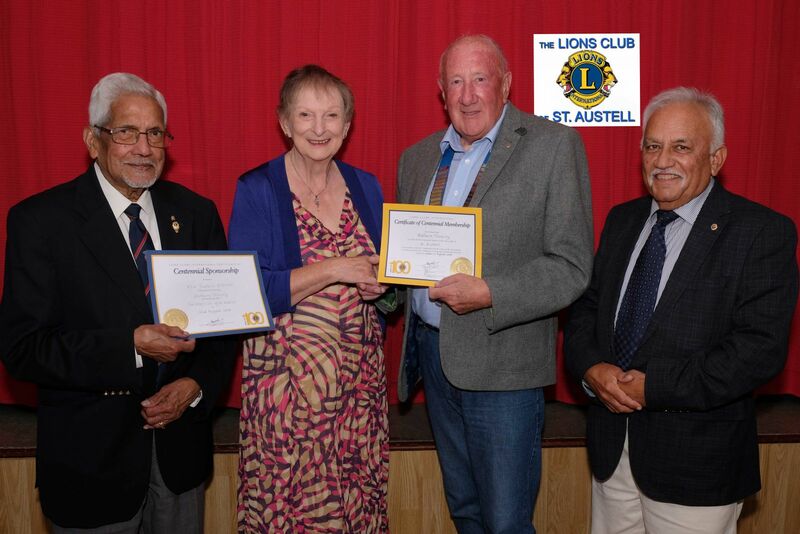 Past District Governor Lion Robbie Bhonsle, Lion Barbara Trenerry, Lion President Michael Collins and Lion Jim Jiwa. iN ORDER TO CONTINUE CARRYING OUT THE ACTIVITIES FOR WHICH WE ARE WELL KNOW IN OUR AREA SUCH AS FATHER CHRISTMAS SLEIGH FOR THE MONTH OF DECEMBER, OUR DUCK RACES DOWN THE ST AUSTELL RIVER IN JULY AND AUGUST, OUR GIANT EASTER EGG DRAW AND OUR MANY ACTIVITIES HELPING THE DISADVANTAGED MEMBERS OF OUR COMMUNITY, WE ARE IN NEED OF HELPERS AND MORE MEMBERS. MANY OF US HAVE BEEN DOING THESE ACTIVITIES FOR OVER 40 YEARS AND ...YES...WE ARE GETTING OLDER!! 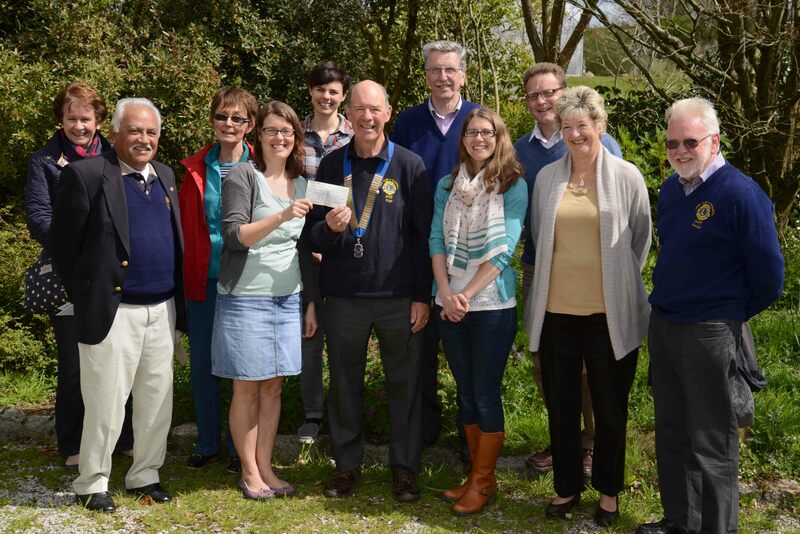 The Lions Club of St. Austell have donated £1000 to Cornwall Hospice Care at Mount Edgcumbe Hospice. ‘The support that Cornwall Hospice Care receives from our community is vital to ensuring that we can provide our specialist care and support to those with a terminal illness in Cornwall. 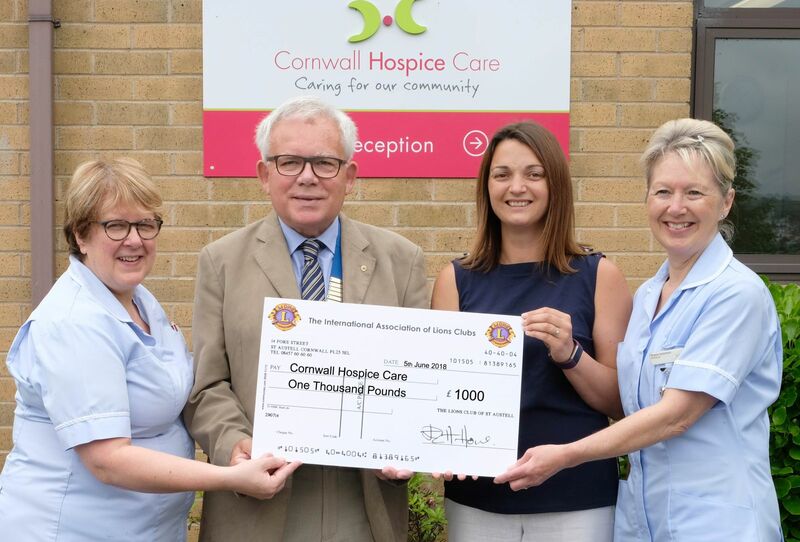 With only a small portion of our care funded by the NHS we rely on the generosity of our community and we are extremely grateful to the St Austell Lions Club for their support, we cannot thank them enough for helping to fund the care’ - Oliver Hoare, Head of Fundraising, Cornwall Hospice Care. 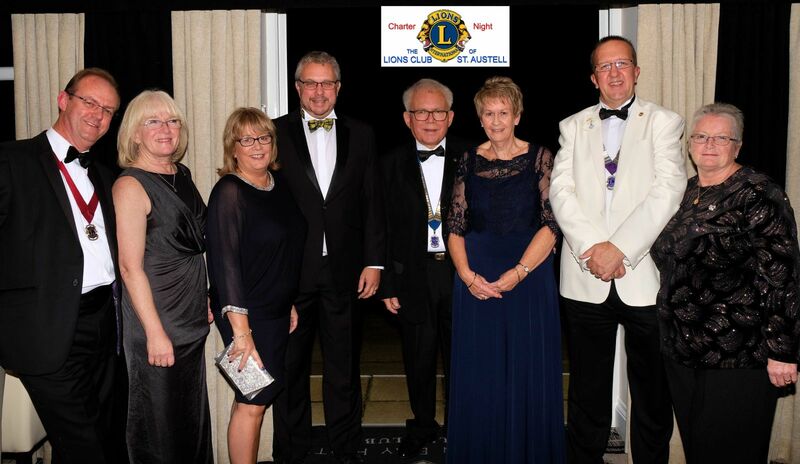 In picture, left to right: Staff Nurse JULIE COLLINGS, Lions Club of St. Austell President ROGER DOVEY, Community Fundraiser JANE APPLETON, and Staff Nurse SHEILA SOLOMON. The Dolphin Inn, Fountain Inn, Ship Inn (Pentewan), Polgooth Inn, Polgooth Post Office & Store, Queens Head (St. Stephen), Western Inn, Seven Stars Inn, Holmbush Inn, the Harbourside Inn, the Carlyon Inn, the White Pyramid Pyramid, Tregonissey War Memorial Club, Penmellyn Veterinary Group and Churchend Veterinary Centre. The total raised for Lions Charities was £963 and the Club would also like to congratulate the lucky winners of the 15 large Eggs and thank the many other members of the public who bought tickets! From the 1st July 2018 the Lions Club of St Austell will become a CIO registered with the Charities Commission with the number 1177541. Individuals and groups my apply to our Charity Committee Chairman Lion Ray Payne whose contact details are madlizzie@hotmail.co.uk in accordance with our Grant Making Policy. 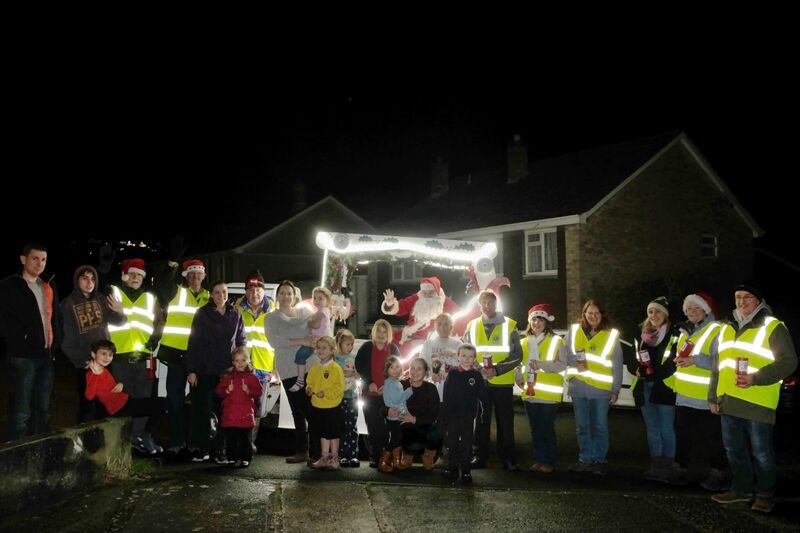 The Lions' Santa Sleigh visited many areas of St Austell just before Christmas, giving great pleasure to children and parents alike. We are delighted to say that, thanks to the generosity of the good people of St Austell, over £3000 was raised in support of local charities. Thank you all very much, and we shall look forward to seeing you all again next December. Meetings. We meet every 2nd (social) and 4th (business) Wednesday at the Britannia Inn, Tregrehan, at 7 for 7.30 pm. 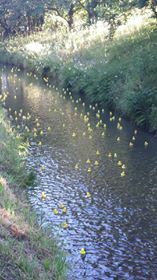 Duck Races every Friday from mid July - early September on the White River just below London Apprentice. 2017 donations included St Austell area Scouts, Sea Cadets, Childrens Hospice SW, Mt. Edgcumbe Hospice, and many other local and international charities amounting to more than £9000. Christmas Sleigh . 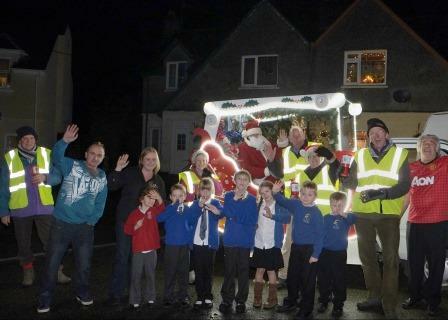 Weekdays from early December for 3 weeks doing door to door collections.with our very own Santa. 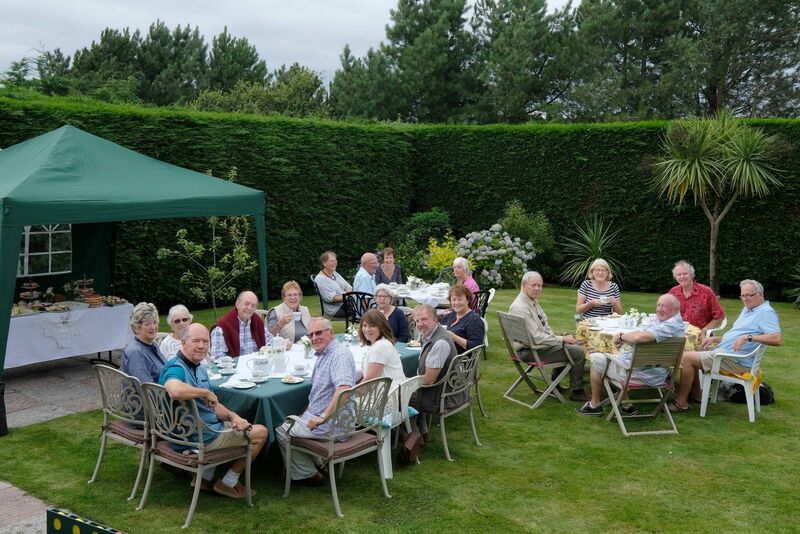 Many Social Events including walks, visits to places of interest (including pubs) and restaurant meals. 2017 was Lions Centennial. 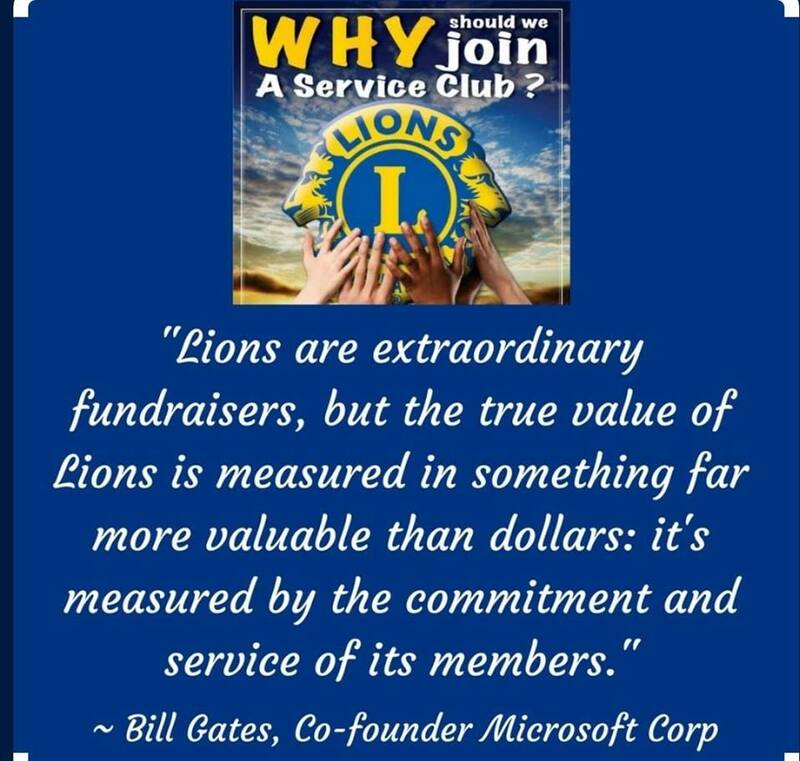 Lions Clubs International has become the world's largest service club organization through 100 years of service. 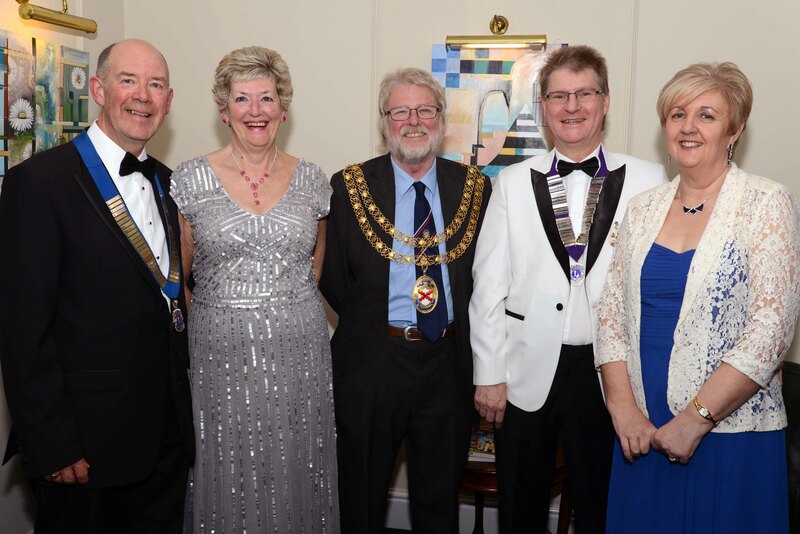 The Lions Club of St. Austell recently held its 49th Charter Anniversary at Carlyon Bay Golf Club. The celebration was attended by over 100 people which included Lions and guests. A great evening, with an excellent meal followed by dancing to the Star Dazzle Disco. Immediate Past President Bill Roberts. The 49th Presidential Handover evening took place at the Chinese Wok Resta urant, Tywardreath Highway, where Lion President Roger Dovey took over from Immediate Past President Bill Roberts. 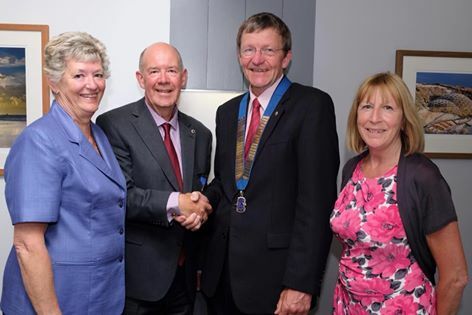 In photo, left to right: Wendy Roberts, Immediate Past President Bill Roberts, Lion President Roger Dovey and Sue Dovey. 2017 season now complete. The weather was not exactly in our favour, but neverless the sum of £1550 was raised for our charity fund. Thanks are due to everyone who helped and the site owners and Meva Harbour Commissioners who allowed us to sell tickets. A big thank you to the punters who braved weather more suitable for the ducks themselves. 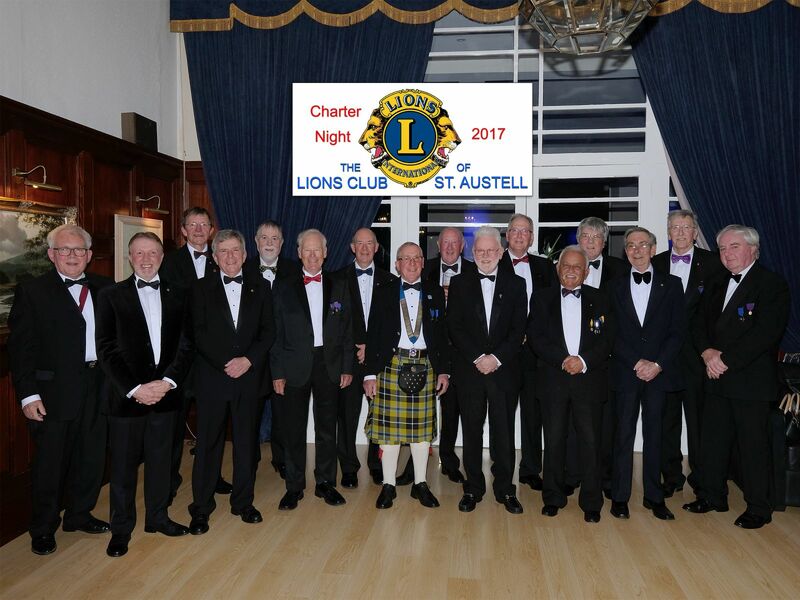 At the Atlantic Hotel Newquay on Saturday 25th March our Lions Club celebrated the 48th Anniversary of the Charter of our club. 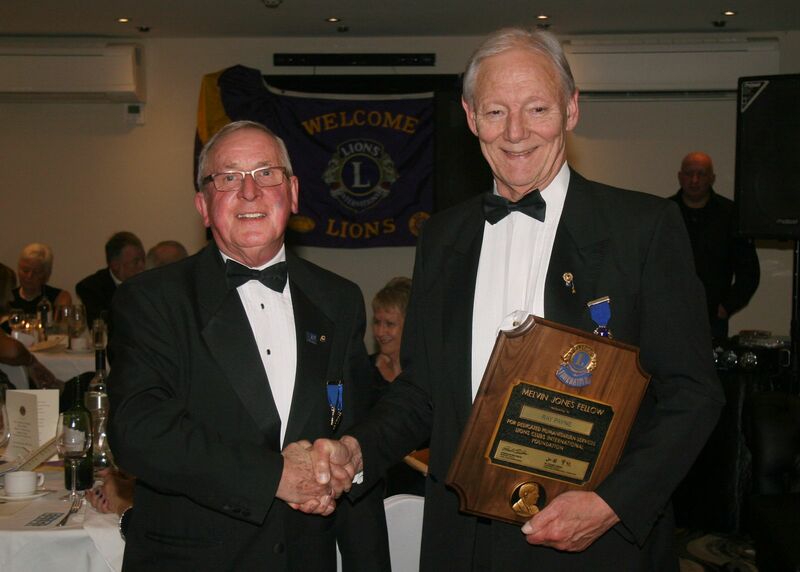 President Bill Roberts was presented with a Melvin Jones Fellowship, the highest award in Lionism. 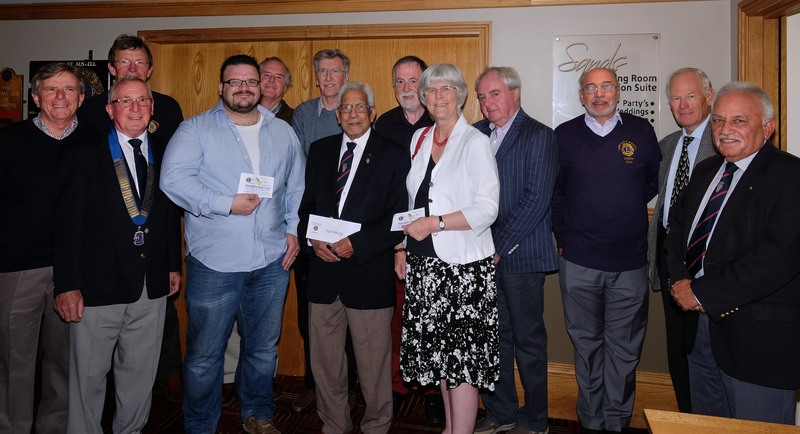 The Lions Club of St. Austell have presented Cornwall County Scouts with a cheque for £2000, money raised by the holding of a special Duck Race held in memory of Lion Robbie Bhonsle's wife Dorothy who sadly passed away last year. She had a lifelong interest in the Cub Scout movement and held the position of County Commissioner for many years. 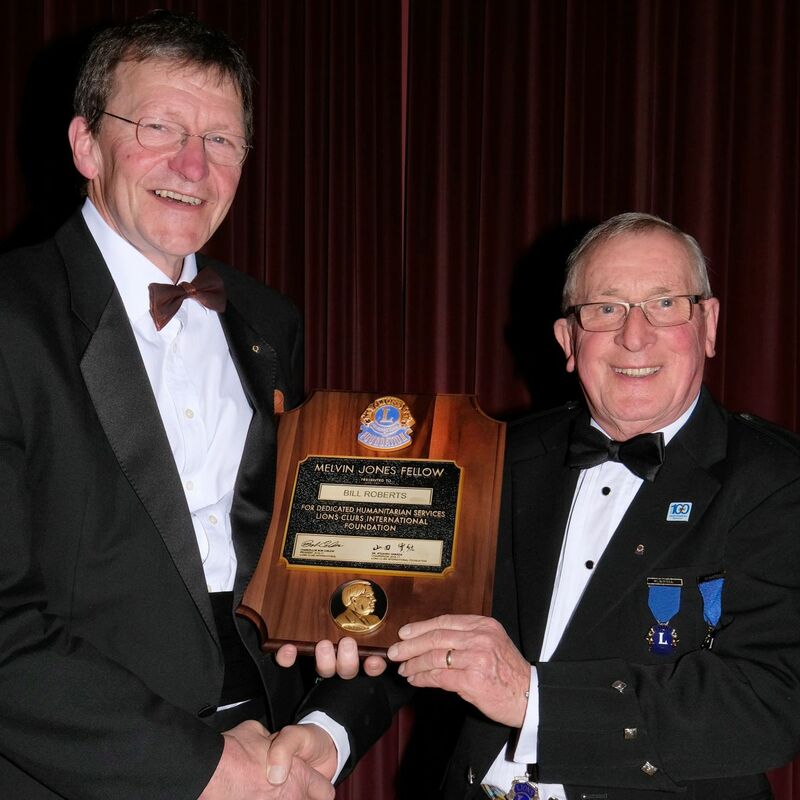 The cheque was accepted by a Trustee of Cornwall Scout Council, Brian Sheen, who gave the Club a witty and most interesting talk on his many exploits, leading expeditions all around the world, with many reminiscences involving the Scout and Cub movement. 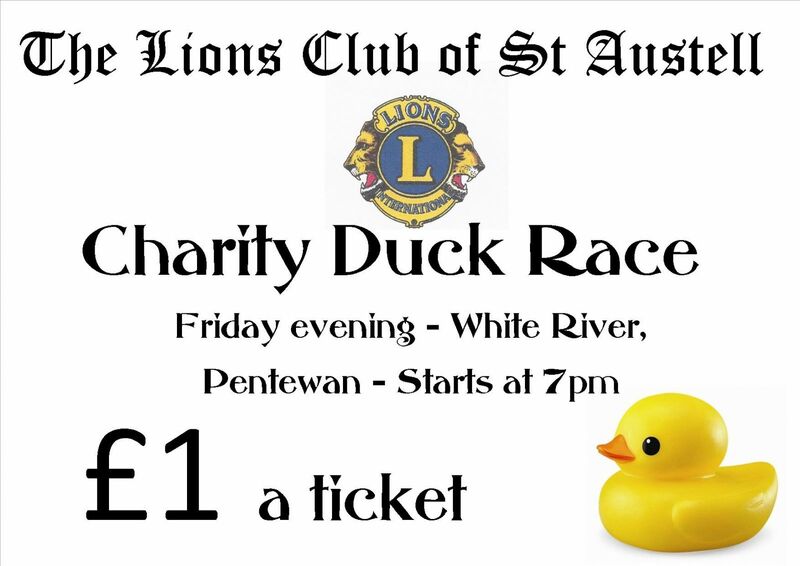 The Lions would like to thank the many members of the public, who by buying Duck Race tickets, enabled the Club to raise such a large amount. The Christmas Hamper Draw at the Stores was won with ticket number 309 by Helen Bellamy of St. Austell. 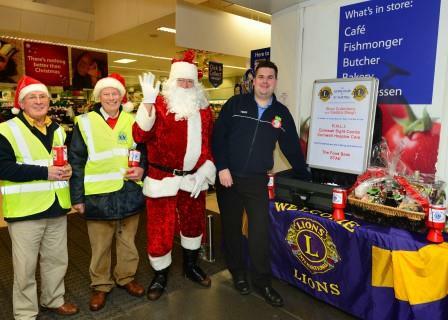 Photo shows, l to r: Father Christmas, Sean Goddard, Customer Experience Manager, Tesco, who drew out the winning ticket and St. Austell Lions President Bill Roberts. The Club would like to give many thanks to Lions Club members, wives, friends and helpers, including local Sea Cadets, Scouts, Round Table and River Valley Garage, the three stores, also Aldi and the COOP who donated items for the Hamper prize, pubs, and of course most of all, the many members of the public who generously gave donations. 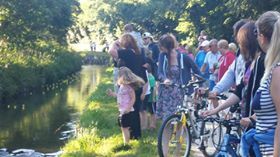 DOROTHY'S DUCK RACE recently held by the Lions' Club of St Austell raised over £2000 for Cornwall Cub Scouts and Lions' charities. Lion Robbie Bhonsle presented cheques for £500 and £250 respectively to the winner, Brett Camborne-Paynter and second placed Pat Pettit at the Britannia Inn. The third prize was won by Suzanne Waide-Bull. 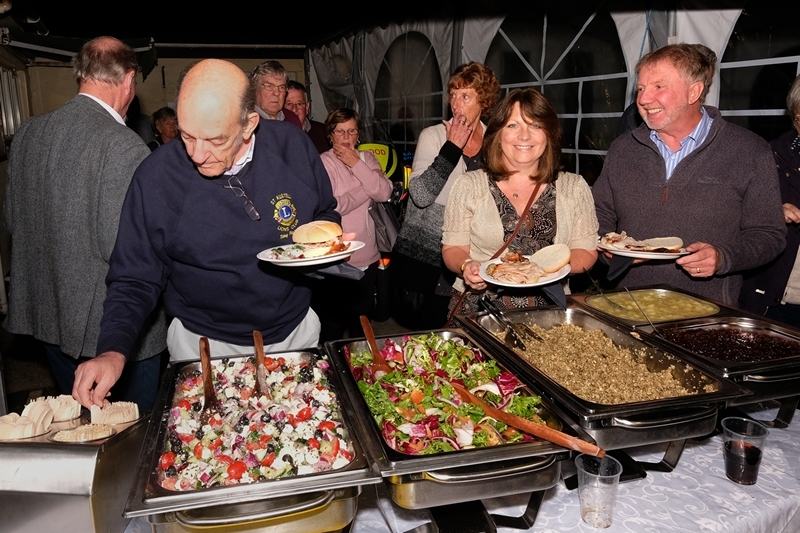 The event raised over £2000 for Cornwall Cub Scouts and Lions' charities. Lion Robbie Bhonsle presented cheques for £500 and £250 respectively to the winner, Brett Camborne-Paynter and second placed Pat Pettit at the Britannia Inn. The third prize was won by Suzanne Waide-Bull. This race was a special event held in memory of Lion Robbie's wife Dorothy who sadly passed away last year. She had a lifelong interest in the Cub Scout movement and held the position of County Commissioner for many years. The Lions' Club of St Austell would like to thank the many members of the public, who by buying tickets made this such a successful event. 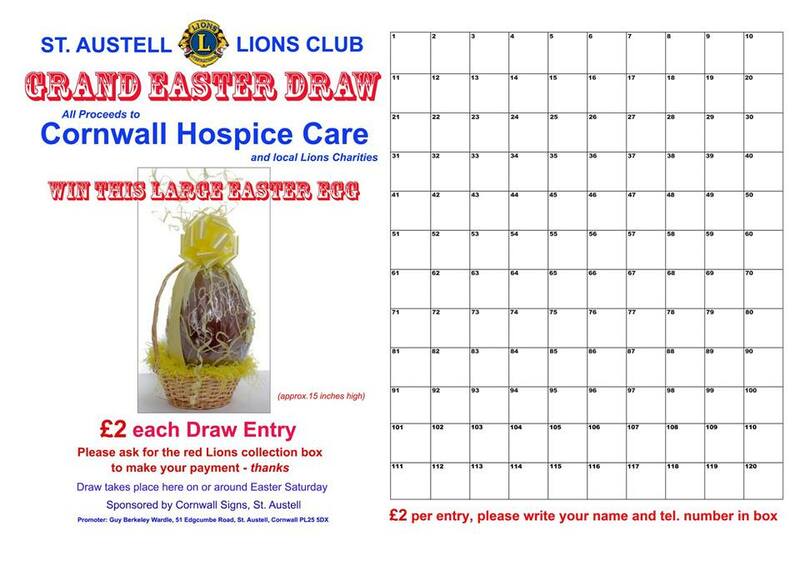 The Lions Club of St. Austell would like to thank the following pubs, clubs and staff for their kind help in running the Club’s Easter Egg Draw: The Harbourside Inn, Charlestown – Simon, the Polgooth Inn – Alex, the Ship Inn at Pentewan – Kim and Andy, the Rashleigh Arms, Charlestown – Lucy, the Western Inn – Rob, the Holmbush Inn – Barry, the Carlyon Arms – Glynn, the Seven Stars – Sara, Tregonissey Club – Heather and Pentewan Sands Club – Laura-Jayne. The total raised for Lions Charities was £816 and the Club would also like to thank the lucky winners of the 10 large Easter Eggs and the many other members of the public who bought tickets! 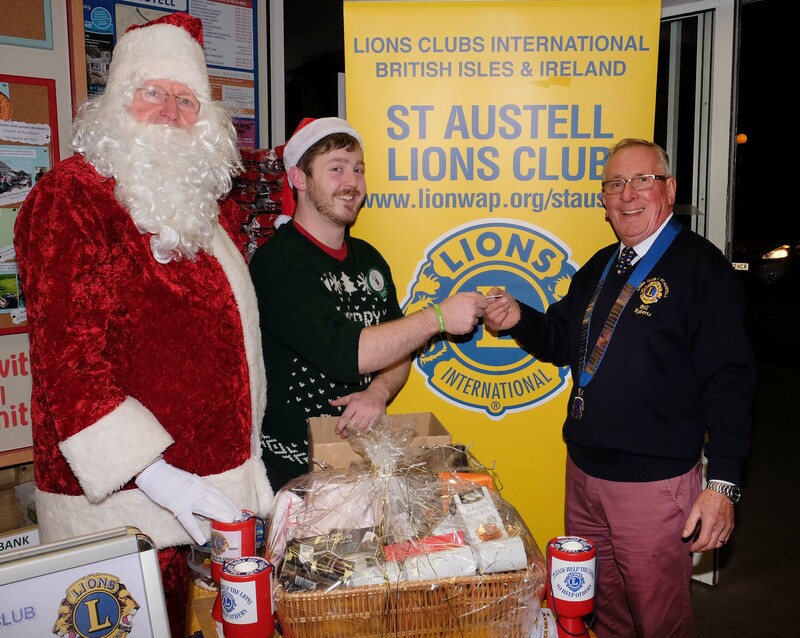 The Lions Club of St. Austell raised a total of £4550 for good local causes from their Christmas Sleigh, and collections at the town’s Asda, Aldi and Tesco stores, and also at local Pubs and Clubs. The winning ticket, No. 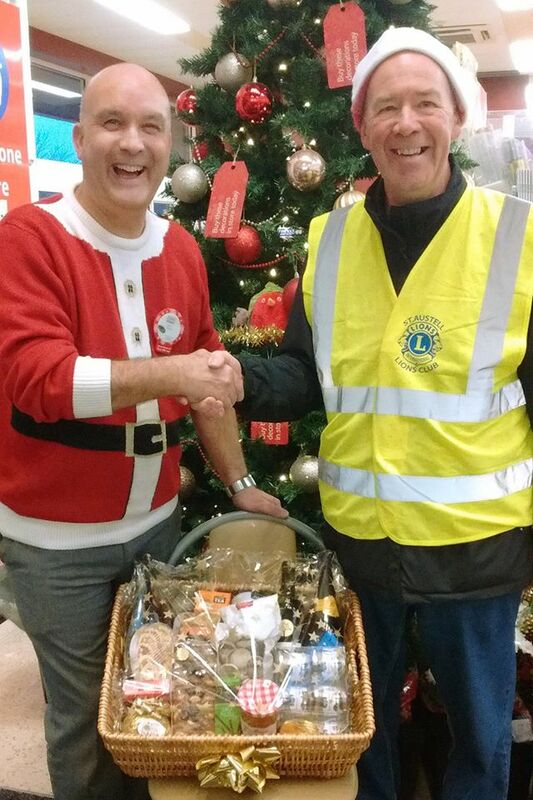 612, for the Christmas Hamper Draw at the Stores was Mr. Dunn of Charlestown. 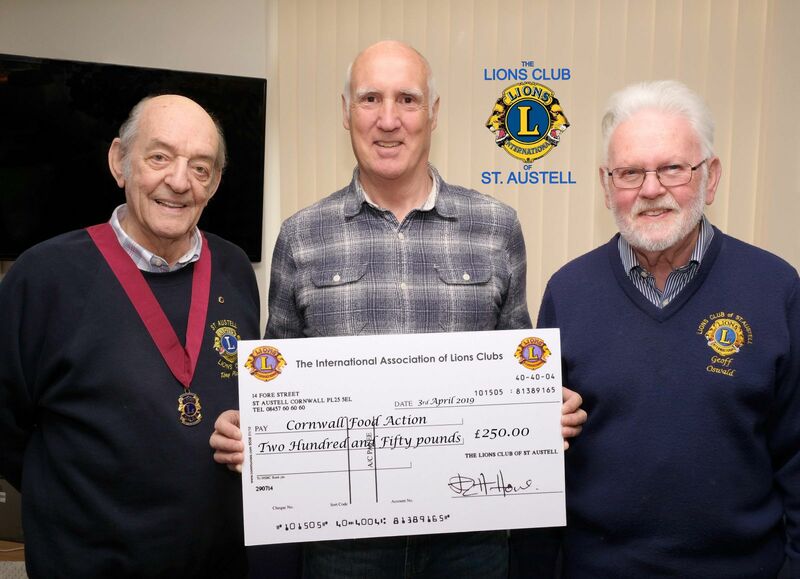 Photo shows, left to right: Stuart Bourn - Tesco Store Manager, who drew out the winning ticket and St. Austell Lions Immediate Past President Geoff Kaye. The Club would like to give many thanks to Lions Club members, wives, friends and helpers, including local Sea Scouts, Scouts, Round Table and River Valley Garage, the three stores, pubs, and of course most of all, the many members of the public who generously gave donations. The Lions Ladies collecting with the Christmas Sleigh. 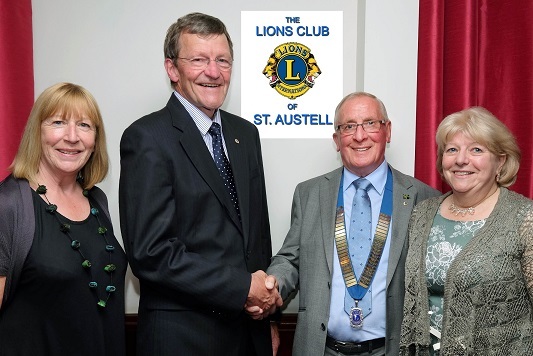 St. Austell Lions President Guy Wardle said: “Each year and particularly at Christmas, the people of St Austell are most generous in the support that they give to the Lions. I should like to express our gratitude to them. 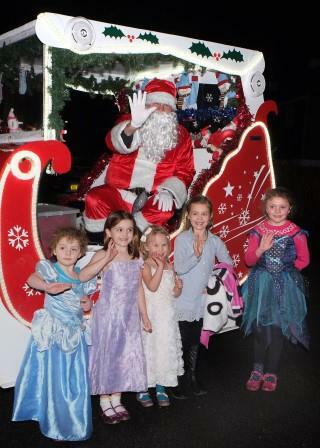 The joy that Santa's Sleigh brings to families, even on a foul night is wonderful to witness". 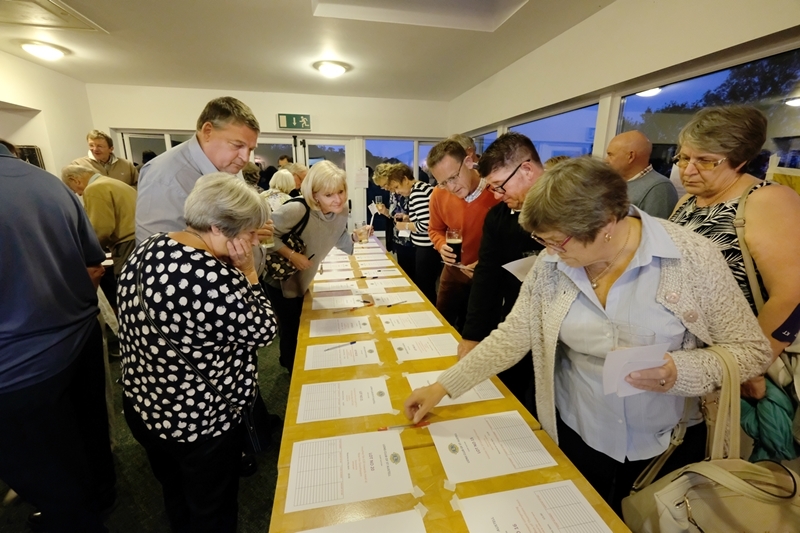 The Silent Auction 2015 held at St Austell Cricket Club on Saturday October 3rd, was again a resounding success, attracting over 70 eager bidders. A total of £1,177 was raised for Headway, the brain injury association, and Penhaligon’s Friends, helping bereaved children and young people in Cornwall. 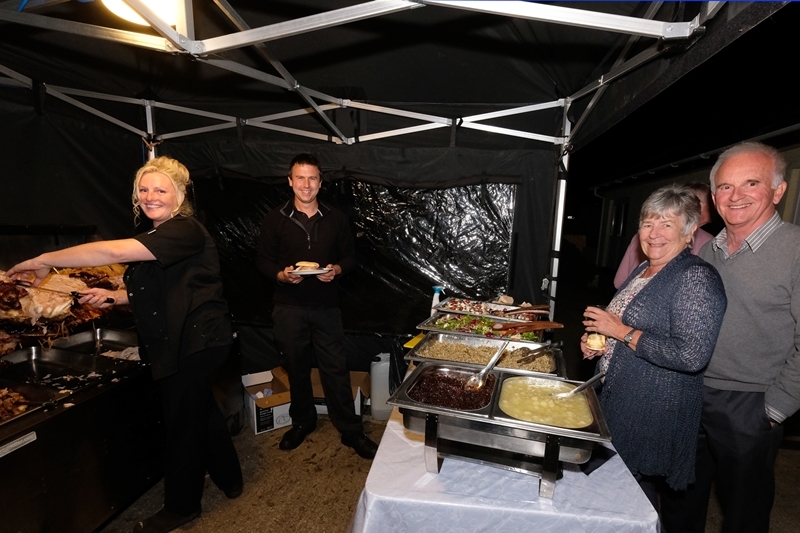 St. Austell Town Mayor, Councillor Brian Palmer, officially declared the start of bidding, and during the evening the bidders enjoyed a delicious Paella by Peter Quinn Event Caterer, followed by scrumptious desserts made by the Lion’s Ladies. 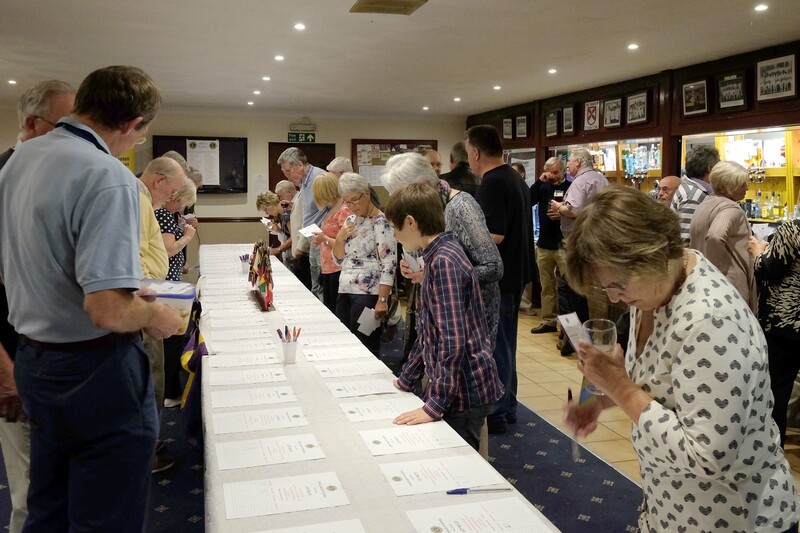 Thanks to the generosity of local businesses and individuals, and those who attended the auction, the evening turned out to be another ‘roaring’ success for the Lions Club of St. Austell. 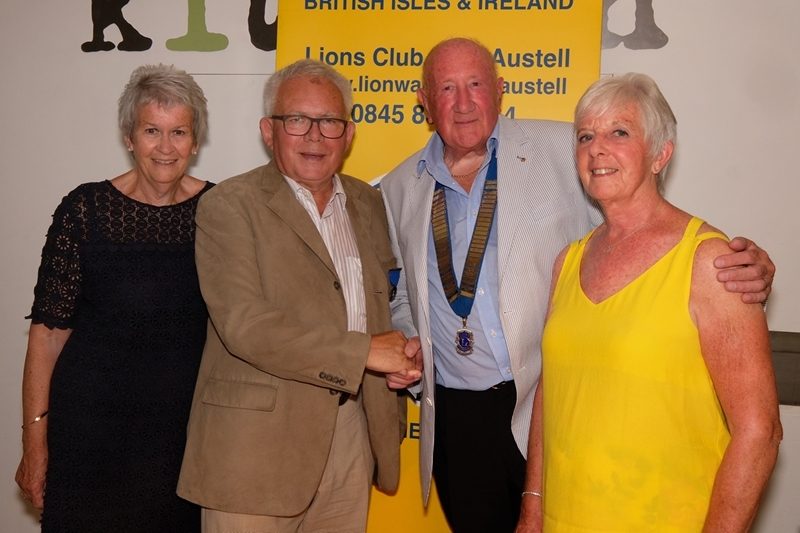 Pictured below left to right: Naomi Kennedy, Penhaligon’s Friends, Silent Auction Organiser Lion Geoff Kaye, Lions Club of St. Austell President Guy Wardle and Frances Colliver, Headway. 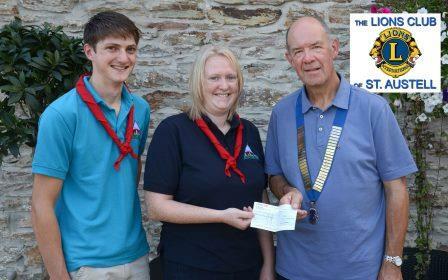 The Lions Club of St. Austell showed their appreciation for the help given to the club at their first Lions Charity Duck Race of the summer season by members of local Scout Groups, by presenting a cheque for £300. In photo, left to right, back row: Peter Volkner - Groups Scout Leader, Mandy Hammond - Cub Leader, Alister Hiscock - Cub Leader, Lions Club of St. Austell President Guy Wardle, Jen Burnett - Guide Leader and Trish Singleton - Cub Leader. The children are from 1st St Stephen Scout Group, Treviscoe Rainbows and Brownies and Treviscoe/St Stephen Guides and Rangers. 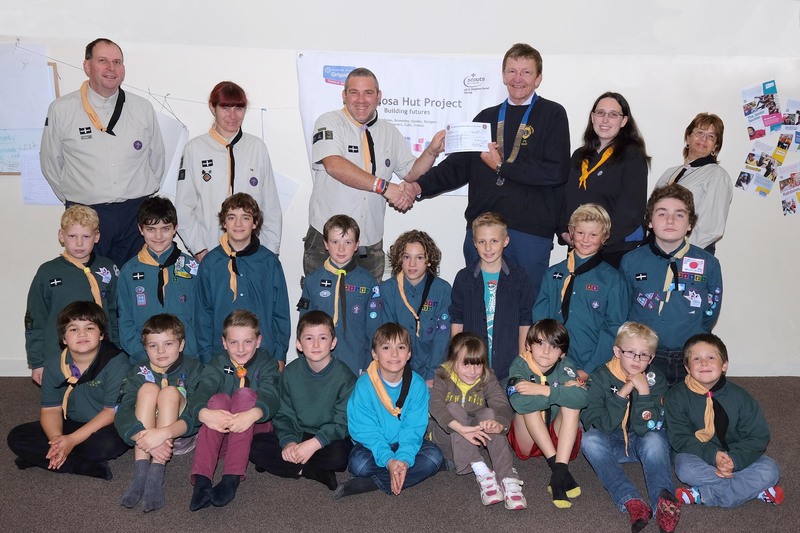 The Scout Group are in the process of raising funds to build a new hut, and have raised the money to pay for the plans to be drawn up and the planning permission secured. The next stage is gaining the interest and support of local businesses and groups who may wish to use a community building in the heart of the clay area. The Scouts will be offering a range of facilities to people who wish to come to a quiet location for their meetings and get-togethers. If anyone is interested please email mandyhiscock2010@hotmail.co.uk, and please follow us on facebook and twitter. 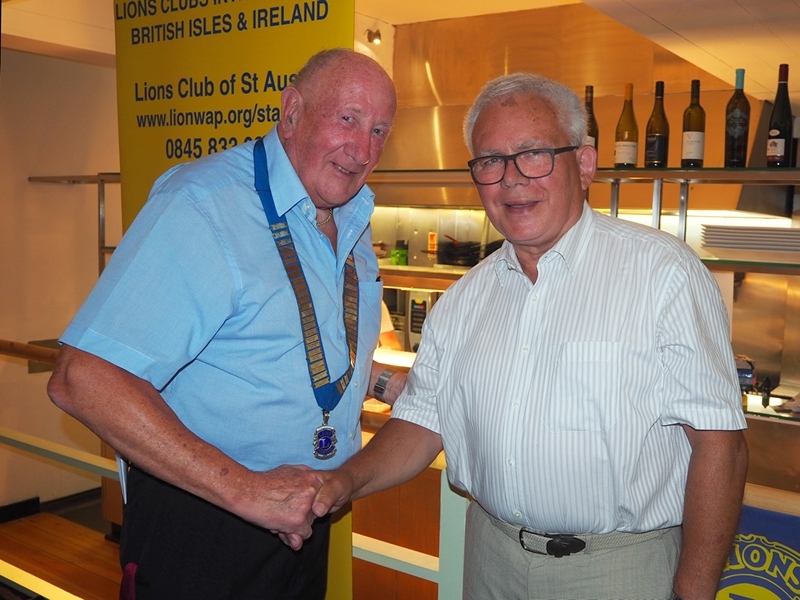 The 47th Presidential Handover took place at ‘Austells’ Restaurant, Carlyon Bay, where Lion President Guy Wardle took over from Immediate Past President Geoff Kaye. New President Guy said ‘For my second term as President, being now retired will enable me to devote myself fully to the role and the activities of the Club’. In photo, left to right: Norma Kaye, Immediate Past President Geoff Kaye, Lion President Guy Wardle and Margaret Wardle. 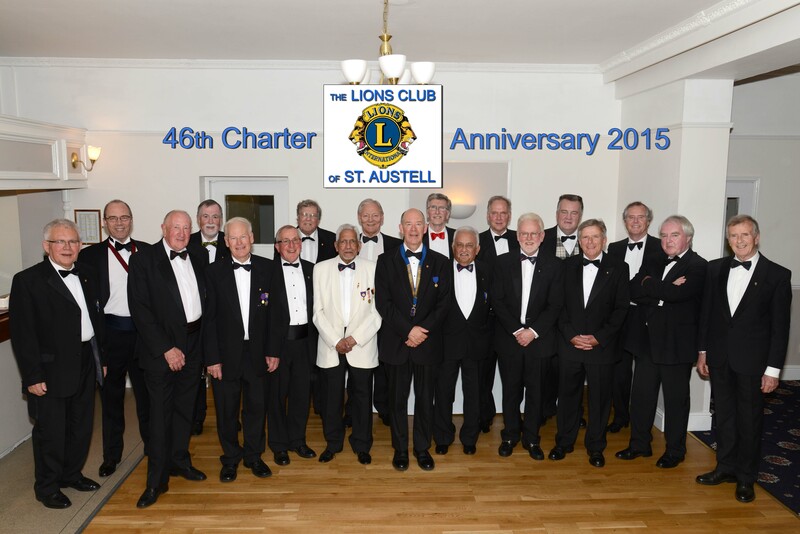 The Lions Club of St Austell had its Charter in 1968 and has as its motto "We Serve". Members give their time freely to help the local community and support projects that cover the globe. Throughout the world there are over 1.3 million members. To the people of St Austell for their generous response to our Nepal Earthquake Appeal. The total was a staggering £2,650. 280 Lifesaver water filtration units capable of treating 4.2 million litres of contaminated water. To complete a very busy month for the club we had our 30th Annual Twinning here in St Austell with Pornichet Lions Club in Brittany. More on our twinning page. 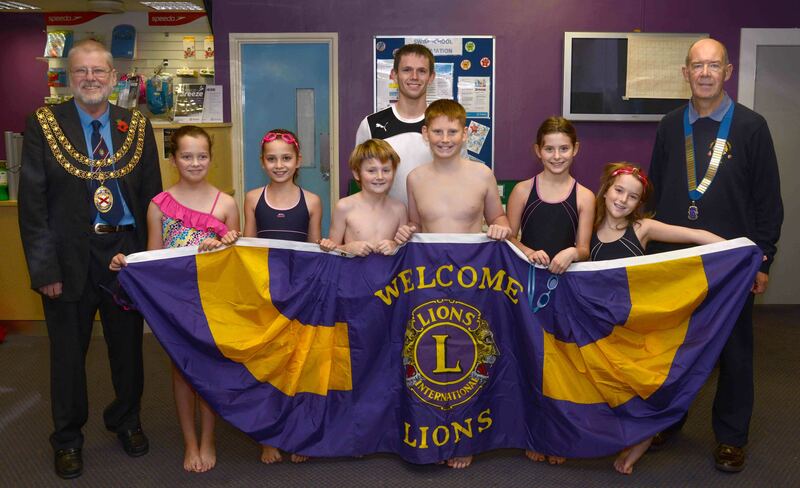 See our Club Projects page for more Lions Activities. Also last week we presented a cheque for £2,000 to the Sensory Trust, a registered charity based in St Austell, which make places accessible, attractive and meaningful for everyone, regardless of age, disability or background. 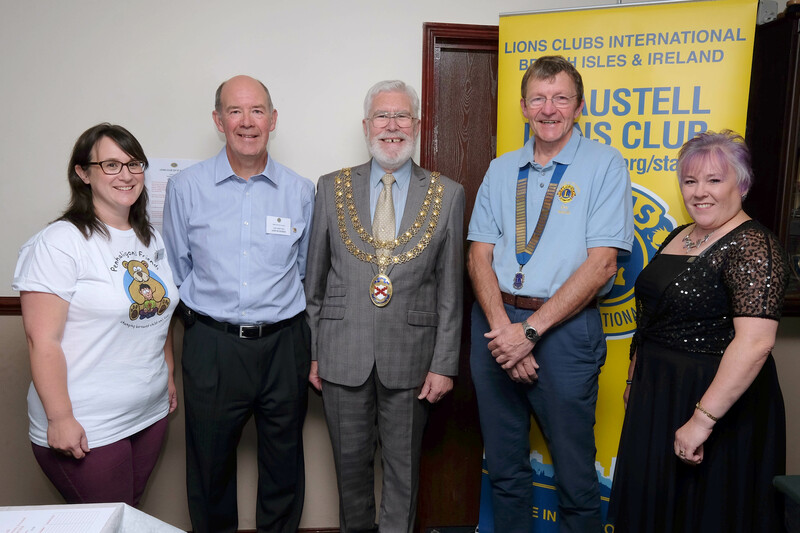 Pictured, left to right: Front Row: Lion Jim Jiwa, Victoria Hutchinson (Sensory Trust Development Manager), Lions Club of St. Austell President Geoff Kaye, Lynsey Robinson (Sensory Trust Inclusive Designer), Norma Kaye and Lion Geoff Oswald. Back Row: Sue Dovey, Jean Oswald, Claire Francis (Sensory Trust), Lion Bob Moore, and Lion Tom Hotton. 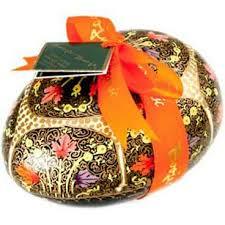 We would like to thank the following pubs and staff for their kind help in running the Club’s Easter Egg Draw: The Britannia Inn – Phil, the Polgooth Inn – Alex, the Ship Inn at Pentewan – Kim and Andy, the Rashleigh Arms, Charlestown – Lucy, the Harbourside, Charlestown – Simon, the Western Inn – Rob, the Holmbush Inn – Barry, the Carlyon Arms – Glynn, Tregonissey Club – Heather, and the Seven Stars – Sara. The total raised for the Sensory Trust and other local good causes was £730 and the Club would also like to thank the lucky winners of the 10 large Easter Eggs and the many other members of the public who bought tickets! A Raffle and other Fund Raising during the evening raised a total of £328.00 for the Sensory Trust and other local Causes. 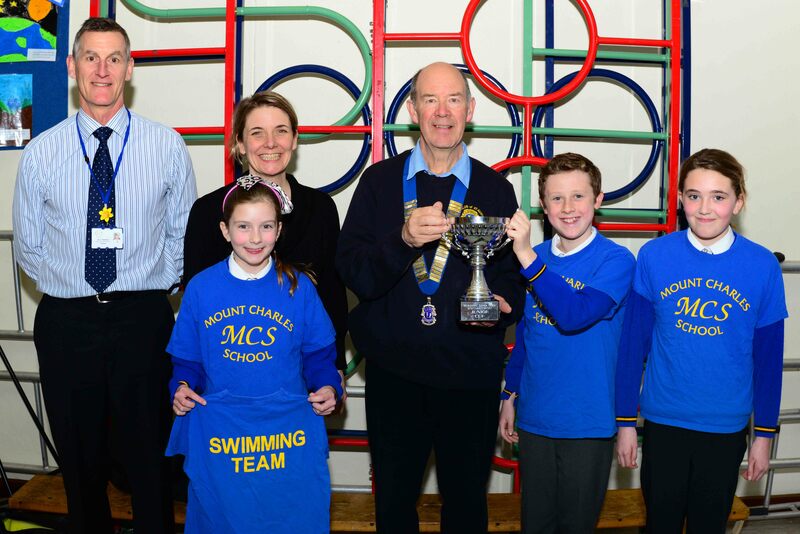 Lions Club President Geoff Kaye presented the Lions Swimathon Junior Cup for largest number of Sponsors, to Mount Charles Primary School. Pictured with Lion President Geoff are Dave Behennah, Teacher in charge of Swimming, Rachel Nile, Teacher, and 3 members of the winning team. 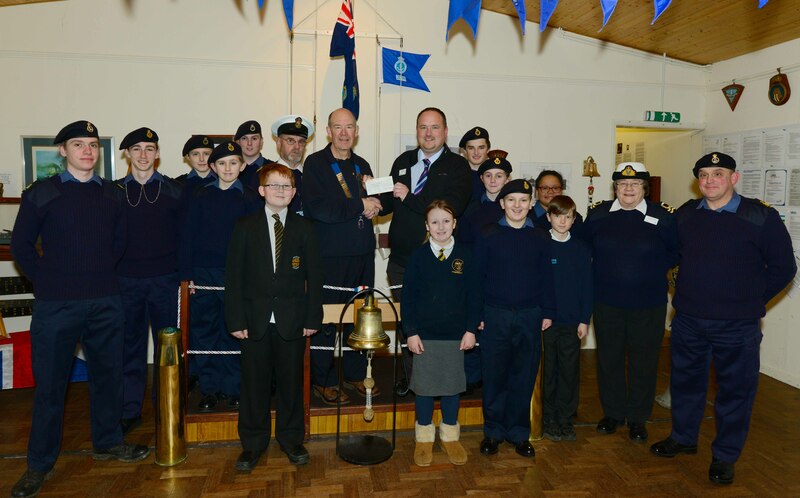 We also presented a cheque for £500 to the Sea Cadets of St. Austell, and Lions President Geoff Kaye warmly thanked them for their help in manning the Club’s Christmas Sleigh last December. 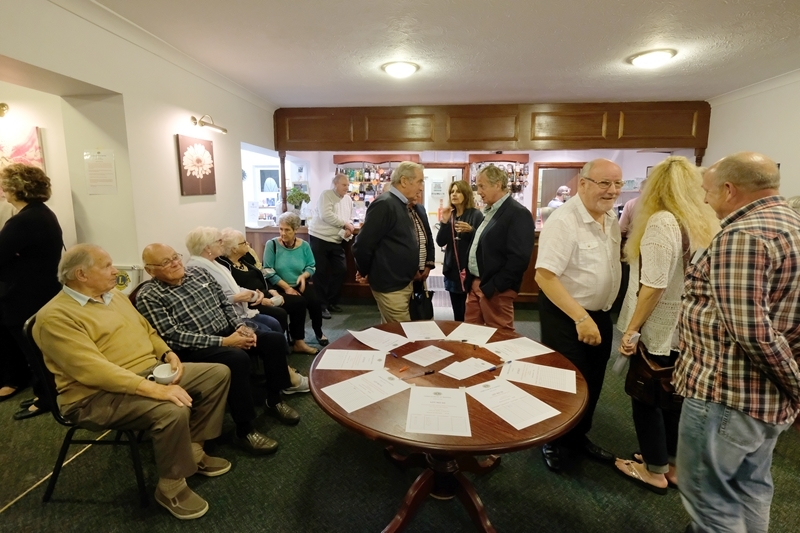 Our January activity was Bullseye Quiz Evening at Porthpean Golf Club. Everyone enjoyed themselves . Competition was won by " Ropehaven Rockets" , the final containing some exceptional arrows! 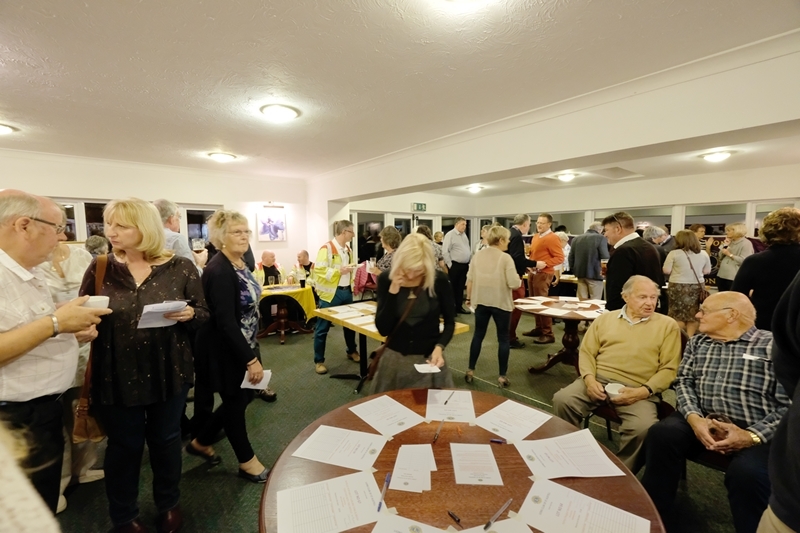 Thanks to all who took part in the quiz and the raffle which raised £185 for the Sensory Trust , to Mike and Ann Tregaskes from Roche Lions for their splendid running of the event and to Gary Tucker from the Golf Club for allowing us to host the event ! 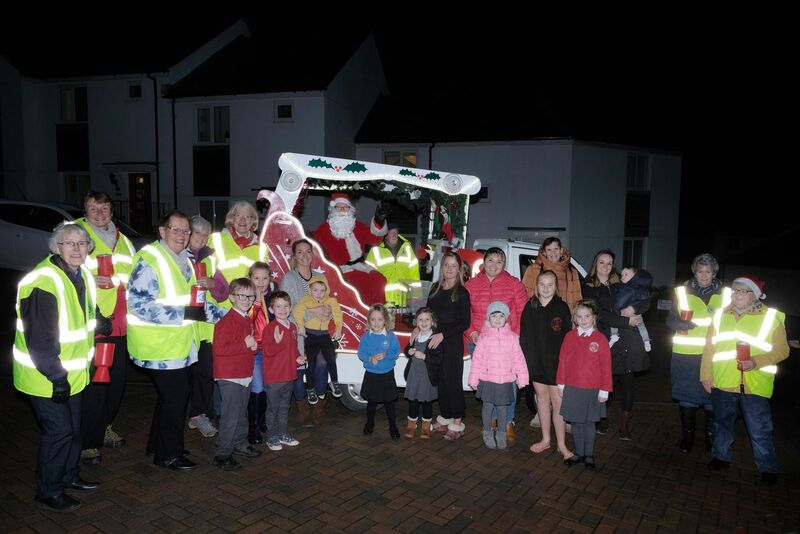 Our Lions Club were out every night of December until Christmas Day with our Xmas Float and store and pub collections, and hundreds of children were able to see and talk to our Santa on the sleigh. We raised a total of over £4800 from the collections at the town’s Asda, Coop and Tesco stores, and also at local Pubs - all for our charitable donations in the coming months. The winner of the Hamper in the free raffle draw was Alison Battleday with ticket number 856. We made a Splash with the Lions! The annual Swimathon at Polkyth took place on Saturday 8th November starting at 11.30am. More details of money raised to follow. 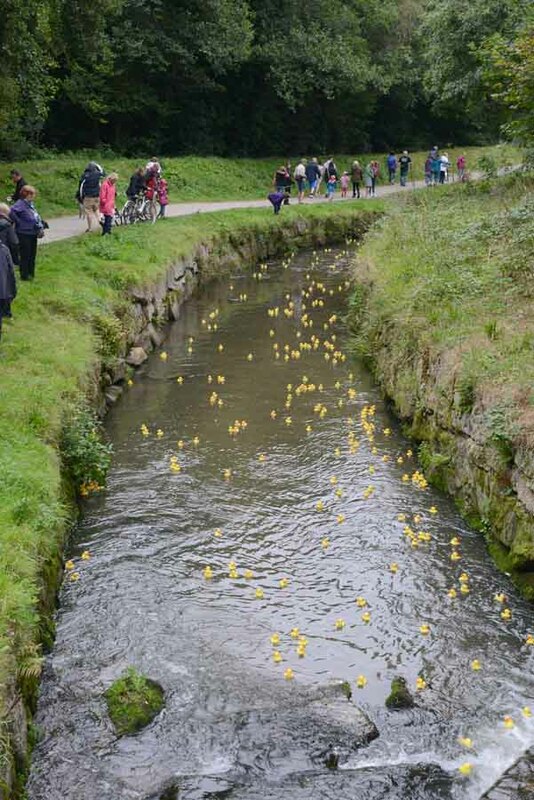 The Lions Club of St Austell annual Duck Race season started on 11th July. Races were held every Friday evening until September 5th. A grand total of £3700 was raised for local charities and the Club would like to thank not just the Club members and partners who helped selling tickets, and at the actual races, but also the many members of the public for buying tickets! Many thanks also to the many camp site owners who allowed us to sell our tickets before each race. 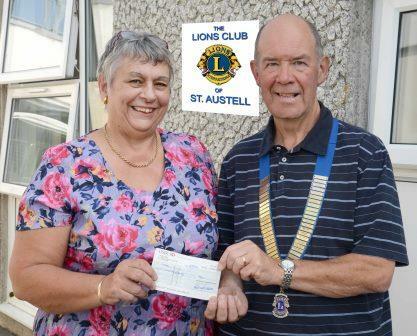 Following The Highly Successful Annual Plant Sale held in May by Lion Geoff Oswald and his Wife Jean, The Lions Club of St. Austell President Geoff Kaye presented a Cheque for £800 to Penny Spencer, Chair of Organisation CRUSE Bereavement Care ,Cornwall. Cruse Bereavement Care based at the Penrice Community Hospital in St .Austell is there to support people after the death of someone close. Face-to-face and group support is delivered by trained bereavement support volunteers. For 35 years Girl Guiding Cornwall has been running a week long service camp - the only camp of its kind in the UK - giving disadvantaged children recommended by Cornwall Social Care the chance to have a much needed holiday. At the camp each child has an older 'buddy' on a one to one basis. These buddies are volunteers usually working towards a service project in Guiding or Scouting or a Duke of Edinburgh Gold Award and they act as mentors, companions and positive role models for the children. This year 24 children aged 7-11 and 24 buddies aged 15-21 attended the camp. 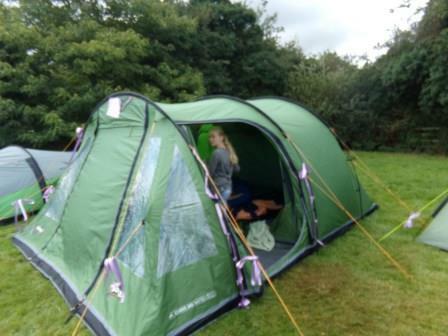 Last year the Lions made a donation of £300 to enable two tents to be replaced. This year a larger number of children than usual was recommended and rather than disappoint any of them all were taken to the camp. This resulted in a deficit in the budget allocated and following a request from Cheryl Smith, the Camp Coordinator, the Lions were pleased to donate a further £200 to cover the deficit. Yet again the Lions Club of St Austell entered a team in the Bodmin Lions Ten Tors Walk. This year, as in the past, sponsorship monies were raised, mostly by John Fitzgerald, to support Action for Children – Kernow Young Carers who provide assistance to over 500 young people in Cornwall. From as young as 4 up to 18 years of age, these youngsters care for their siblings or parents. In photo is Lion President Geoff Kaye presenting a cheque for £1000 to Family Support Practitioners Dawn Maddern and Liz Digweed. Last years donation enabled 35 young people to go, many for the first time, to a pantomime at the Theatre Royal in Plymouth and it is hoped that a similar trip can be arranged this year. 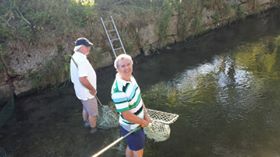 Every Friday evening at 7 pm on the St Austell River until Sept 5th. Race is over 5 furlongs, and lasts 20 to 35 minutes according to the river level and weather.Cash prizes for winning ducks. Photos courtesy of Lion Tim Lean & Charlotte. Lions Club of St. Austell members and partners enjoyed a warm welcome and a very informative visit to the CHICKS charity at Tywardreath. 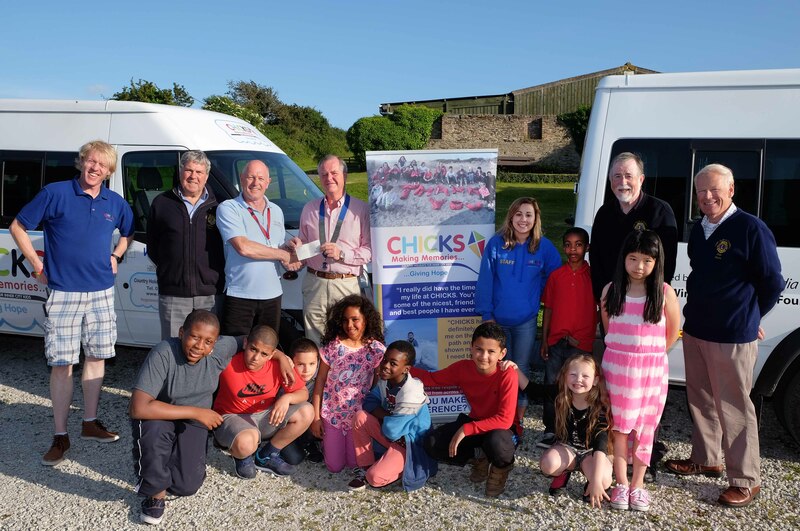 CHICKS is a national children’s charity that provides free respite breaks for disadvantaged children aged between 8 and 15 from across the UK. Last year alone they helped almost 100 children from across Cornwall, including 11 from St Austell. 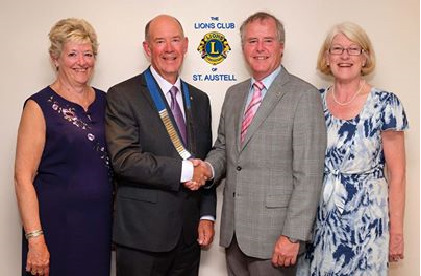 The 46th Presidential Handover took place at St. Austell Golf Club, where Lion President Geoff Kaye took over from Immediate Past President Martyn Robinson. Geoff, from Leeds, Yorkshire, originally re-located to Cornwall with his Company J.I. Case as a key worker in 1981, where he met his wife Norma . When Case closed the Redruth Factory in 1990, Geoff and Norma moved firstly to France with the Company for 10 years, followed by 7 years in Turin Italy and finally 2 years in Racine, Wisconsin, USA. In 2009 Geoff, who was a Director of Global Supply Chain, and Norma retired, after 42 Years with Case and CNH Companies and returned to Cornwall to be near their family, who had stayed in Cornwall all the time Geoff and Norma were living abroad. Norma Kaye, Lion President Geoff Kaye, Immediate Past President Martyn Robinson and Fiona Robinson. 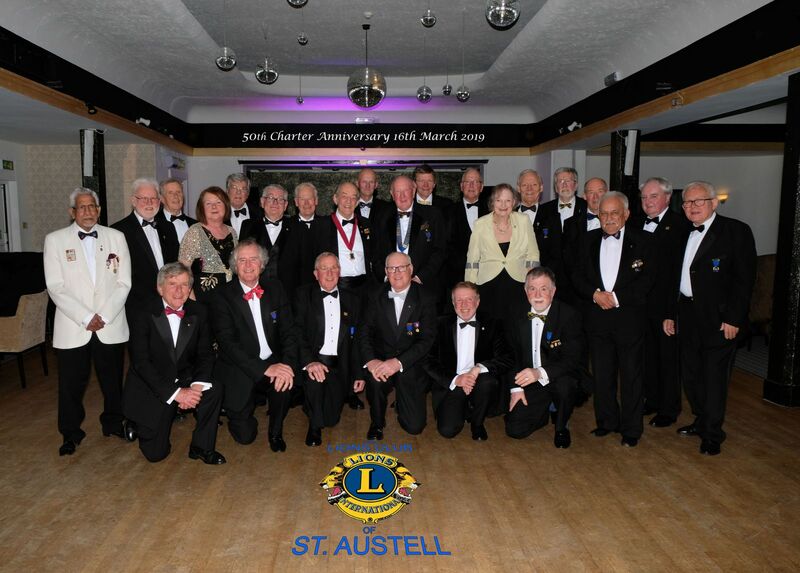 The Lions Club of St Austell had its Charter in 1968 and has as its motto "We Serve". Members give their time freely to help the local community and support projects that cover the globe. Throughout the world there are over 1.3 million members. 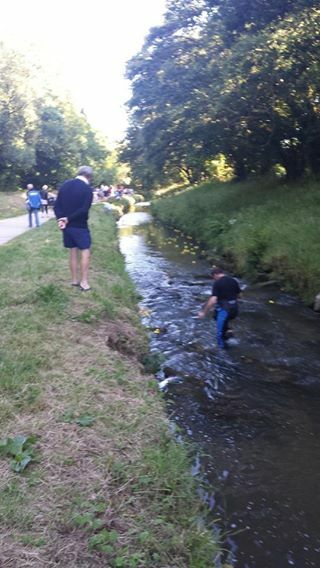 Fundraising includes "Duck Races" near London Apprentice every Friday evening at 7pm throughout the summer until 5th September. The 18 clubs in Cornwall combined for the Annual Diabetes Awareness Project for the 3 days. 1454 persons were checked of which 112 were referred to their GP's for further tests, and the displays helped to raise public awareness of the condition. Grateful thanks to the local nurses, Lloyds pharmacy and FAC financial services for their help. Both Club Presidents in Medieval costume for the Saturday evening Banquet in Baronial style with dancing. 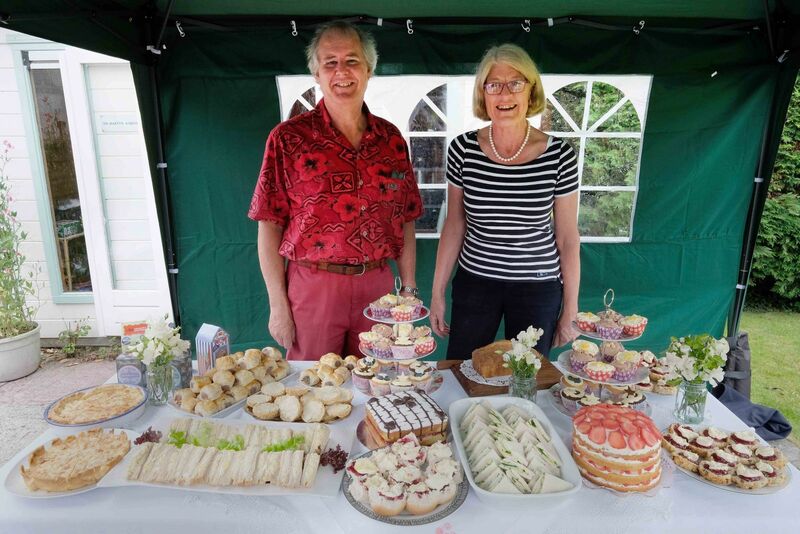 On Sunday afternoon games were played to raise money for our joint charity, followed by traditional dances performed by Pornichet wives in costumes which they made themselves, Speeches, Galettes and Crepes finished off an enjoyable day. 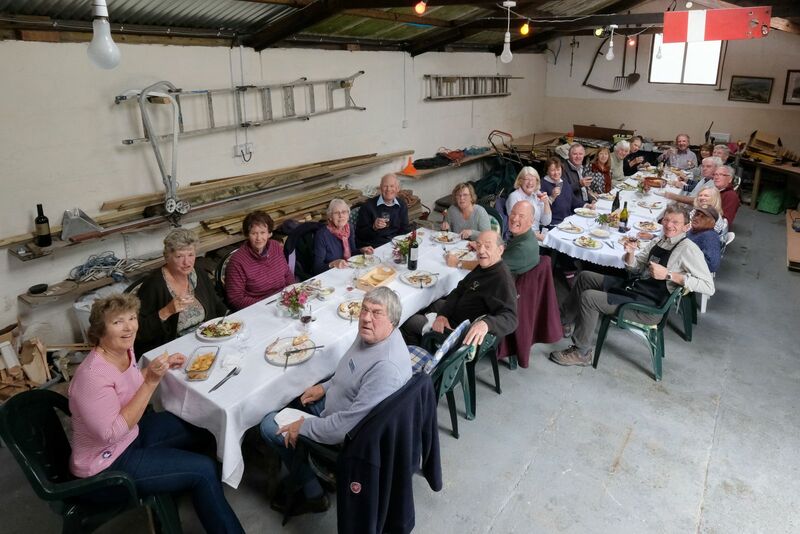 This event was held over the weekend of 10/11 May at the home of Lion Geoff Oswald and, despite rain and gales, raised £1851, one third of which goes to our Lions Club and the rest shared between Restormel Concert Band, our local community wind band, and the St Austell Soroptimist Club who are raising money this year for the Merlin Centre. Thanks to all who supported this venture. In December the we donated to the St Austell Foodbank and to STAK to help them meet the additional need over the Christmas period. There has been an increasing demand for the services provided by these charities, so the Lions decided to make further donations bringing the totals to £1000 to the Food Bank and £500 to STAK. The photo shows Lion Vice President Geoff Kaye presenting the cheques to Kim Mathews from STAK and Steve Williamson from St Austell Foodbank. 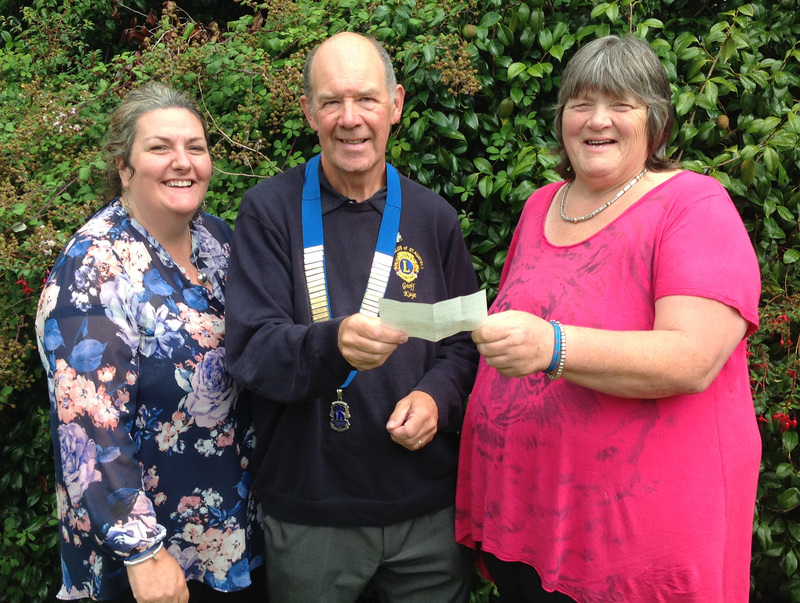 The Lions Club has made donations of £1000 each to the Club’s three main charities chosen this Presidential Year: Cornwall Hospice Care, the Cornwall Blind Association and the R.N.L.I. 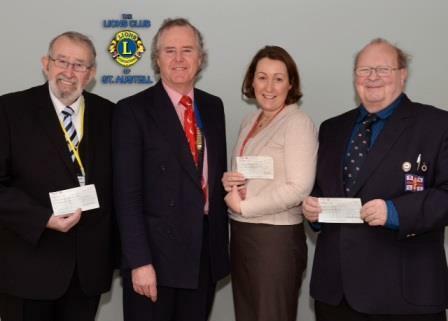 Lions Club of St Austell President Martyn Robinson is pictured presenting the cheques to Vic Coop from the Cornwall Blind Association, Clare Bray from Cornwall Hospice Care and Richard Denham the Chairman of the St. Austell Branch of the R.N.L.I. 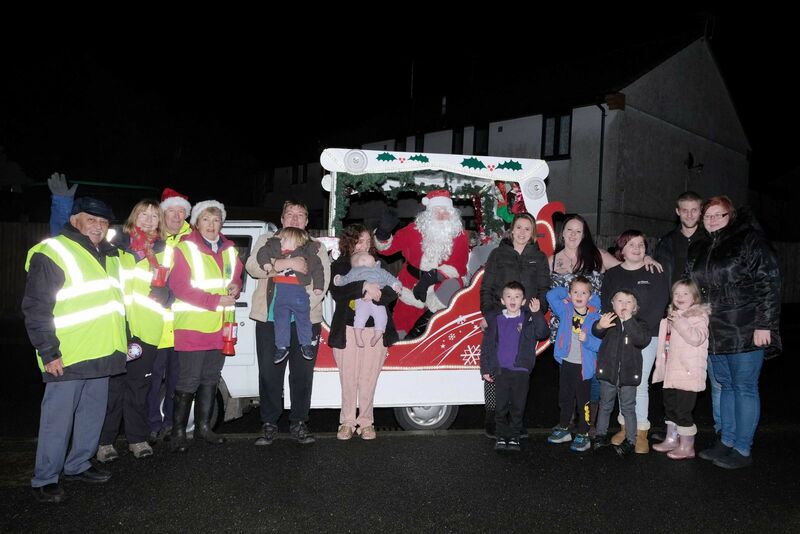 The Lions Club of St. Austell Annual Christmas Sleigh, with Father Christmas on board, celebrated 4 decades of service visiting the children of St. Austell and area. 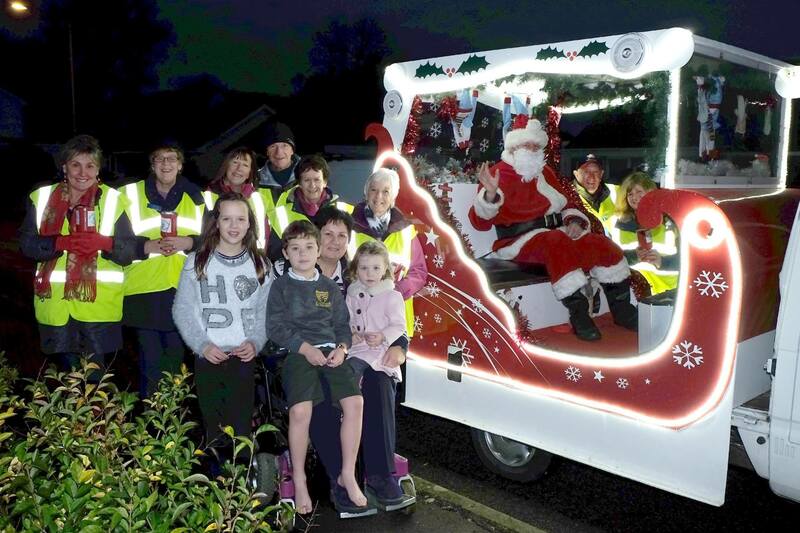 It has progressed over the years from a simple trailer, an old taxi, and now a purpose built float mounted on a dedicated pick-up truck.This year the Lions Club tried to cover a greater area of St. Austell, with an earlier start at 4.30pm, in an effort to be able to be seen by more children. 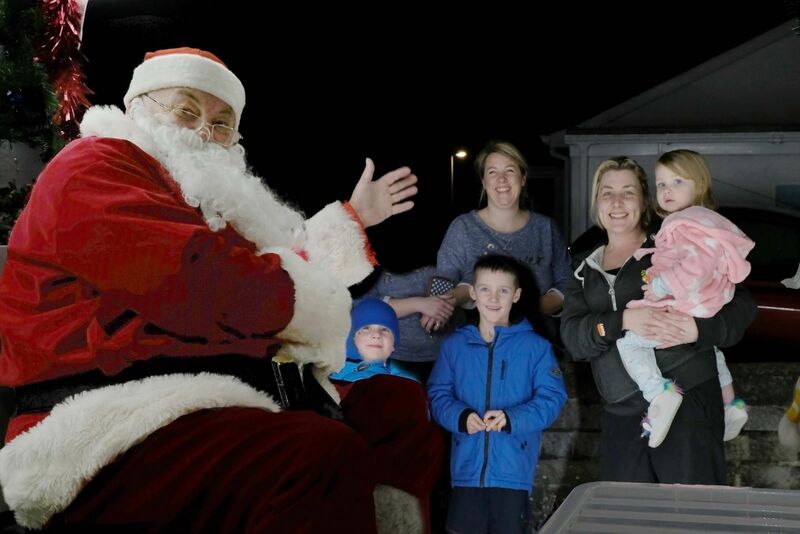 Unfortunately it is impossible in 16 nights to visit every house in our ever expanding town and surrounding area. 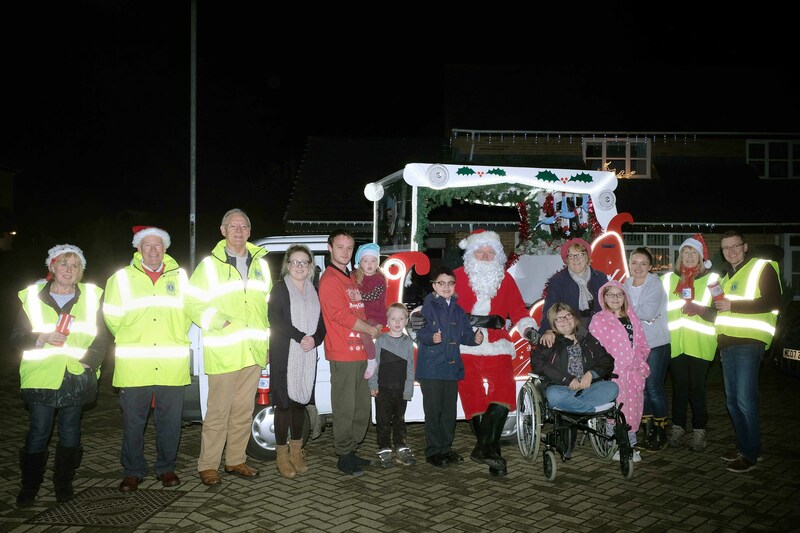 Sleigh collections totalled over £3,000. Donations have already been made to the Food Bank and STAK. A total of over £1700 was raised during the Christmas Collections at the town’s Asda, Coop and Tesco stores. Charities supported by the Club this year are the R.N.L.I., the Cornwall Sight Centre, Cornwall Hospice Care, The Food Bank and S.T.A.K. The winner of the Hamper in the free raffle draw was Lisa Banks with ticket number 0296 and Tesco Manager, James Sanders, is pictured below making the Raffle draw. 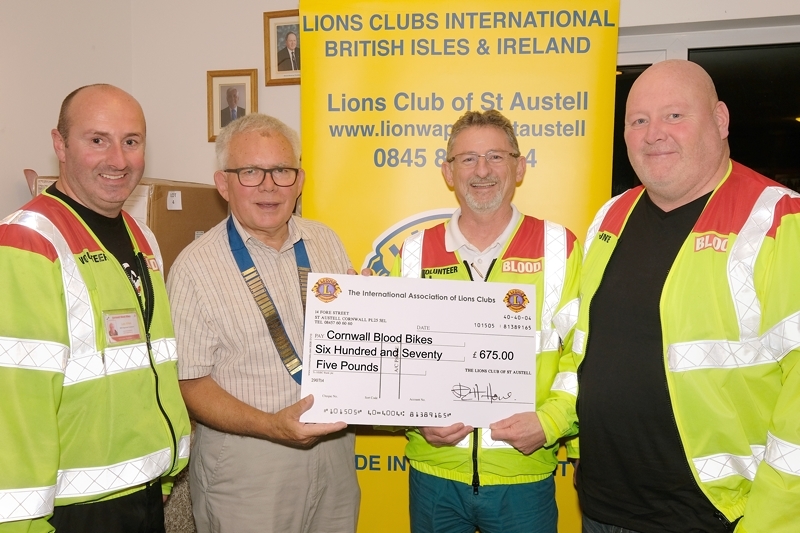 St. Austell Lions Club would like to give many thanks to all three supporting stores, and, of course, the many members of the public who generously gave donations. £450 was collected in one evening. Many thanks to the pubs for allowing us to collect and their customers for their generosity. The annual Swimathon on Saturday 9th November was started by the Mayor Mr Steve Double . Thanks go to the staff of Polkyth Leisure Centre for their help with Life Saving and Setup, Volunteers from the Red Cross and St John Ambulance who provided First Aid Cover, and to everyone who helped to make this event successful. 31 teams entered the event, that was organised and administrated by Lion Geoff Kaye. The teams raised sponsorship per lap for their own causes of approximately £2500. St Austell Swimming Club completed the most laps, 105, and will receive the Darren Eastmond Shield and in doing so beat their rivals St. Austell Polo club and Polzeath Surf Life Savers who completed 99 and 87 laps respectively, with Penrice Academy producing a creditable 91 laps. Trophies for the Junior and Senior schools who raised the most sponsorship will be presented once the final totals have been confirmed. We look forward to any local group who wish to raise money for good causes to contact us via our web site http://www.staustelllionsclub.co.uk/ or on our Facebook Page for more information if they wish to take part next year. Tom Hotton, a G.P in Mevagissey, became the newest member of the club recently. He is looking forward to sharing in our twice monthly meetings at the Britannia Inn and participating in all our social and fund-raising events throughout the year. We now have 29 members. 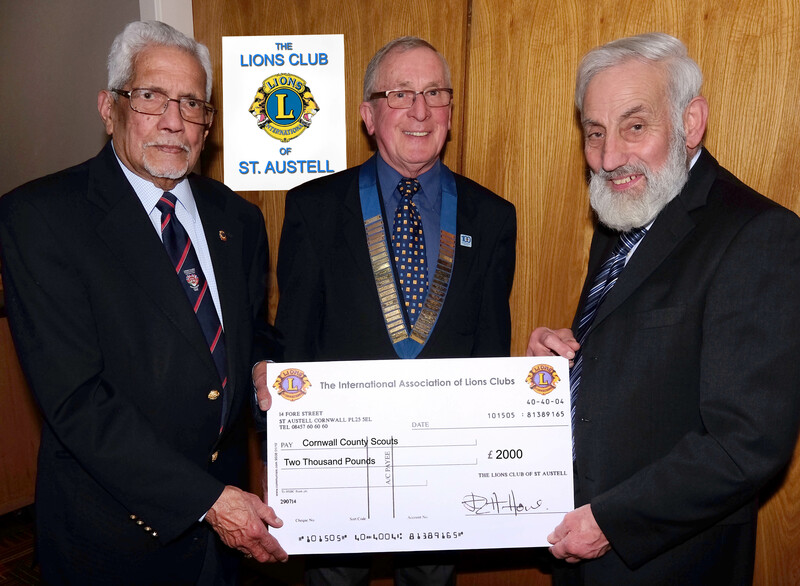 St Austell Lions Club was chartered in 1969 and has 25 members. As you will see, we serve the community by our service and fund-raising activities, as well as a range of social acitivities within the club. 100% of the proceeds from public events are returned to the community through our projects and donations.